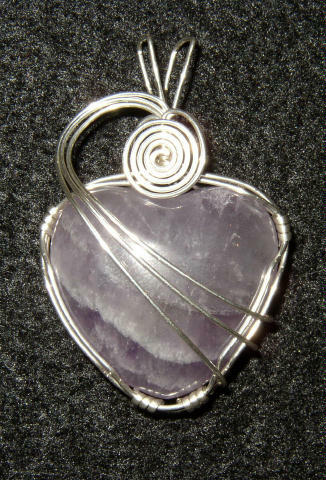 This wire wrapped pendant made from sterling silver and a puff heart polished Amethyst from China. 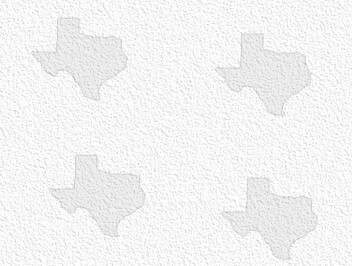 The approximate dimensions are : 1 1/4" W X 1 1/4" H X 1/2 " D. Includes a cord. 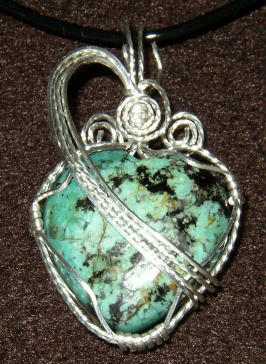 This wire wrapped pendant made from sterling silver and a puff heart polished Turquoise from AZ. The approximate dimensions are : 1 1/4" W X 1 1/4" H X 1/2 " D. and includes a cord. 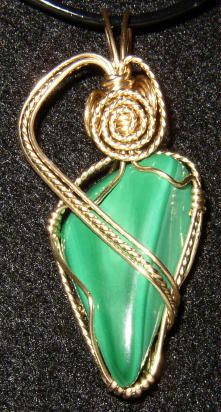 This wire wrapped pendant made from 14/20 Gold Fill wire and a free form polished Malachite cabochon from Zaire. 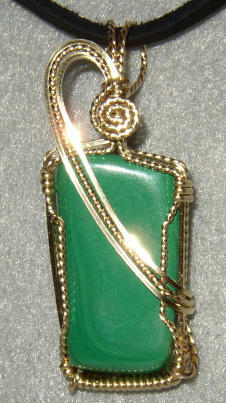 The approximate dimensions are : 1" W X 2" H X 1/2 " D. and includes a cord. 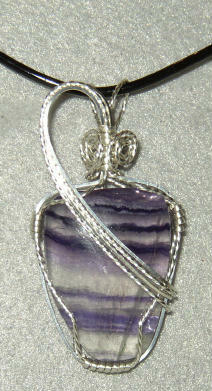 This wire wrapped pendant made from Sterling Silver wire and a free form polished Rainbow Fluorite from Mexico. 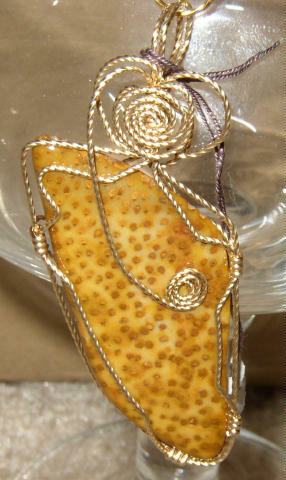 The approximate dimensions are : 1" W X 2" H X 1/2 " D. and includes a cord. 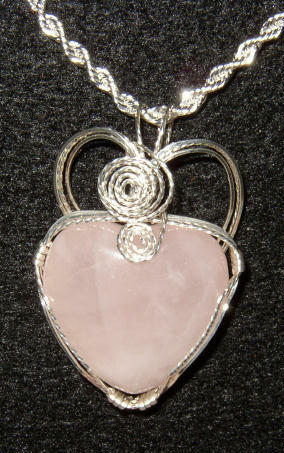 This wire wrapped pendant made from sterling silver and a polished puff heart Rose Quartz cabochon. The approximate dimensions are : 1 1/4" W X 1 1/4" H X 1/2 " D. and includes a cord. 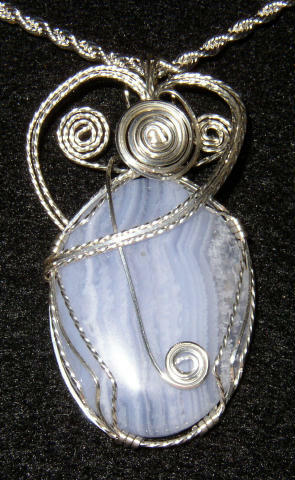 This wire wrapped pendant made from sterling silver and a polished Snow Flake Obsidian cabochon. The approximate dimensions are : 1 1/4" W X 1 1/4" H X 1/2 " D. and includes a cord. 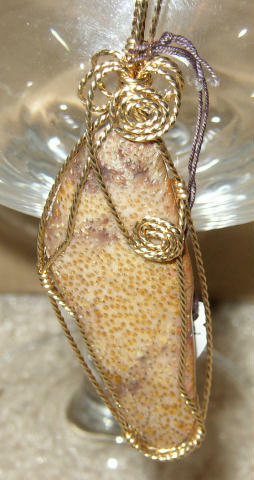 Wire wrapped pendant made from 14K/20% gold fill wire and tumble polished Petrified Palm Wood from East Texas. 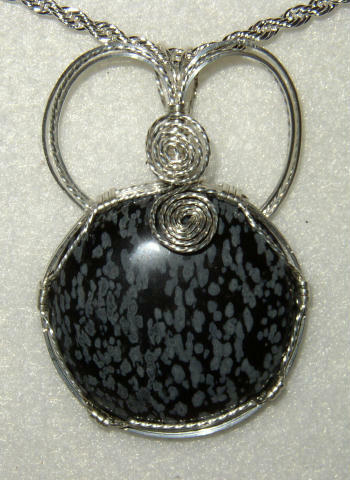 The approximate dimensions are : 1" W X 2 1/2" H X 1/2 " D. and includes a cord. 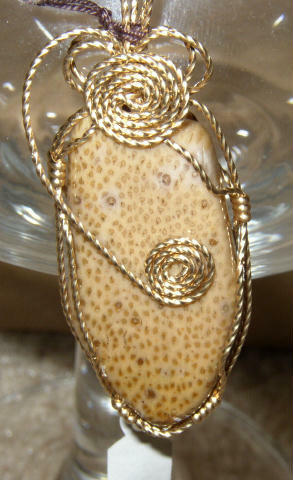 Wire wrapped pendant made from 14K/20% gold fill wire and tumble polished Petrified Palm Wood from East Texas. 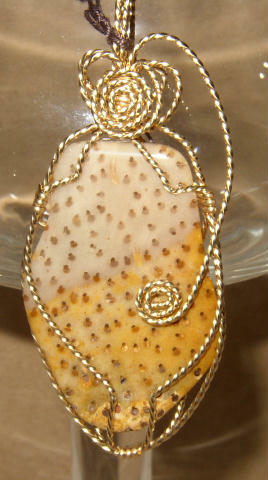 The approximate dimensions are : 1" W X 3" H X 1/2 " D. and includes a cord.